JOEL Embiid shot 21 points and claimed 17 rebounds while Jimmy Butler scored 22 as the Philadelphia 76ers beat the Sacramento Kings 123-114 in the NBA. 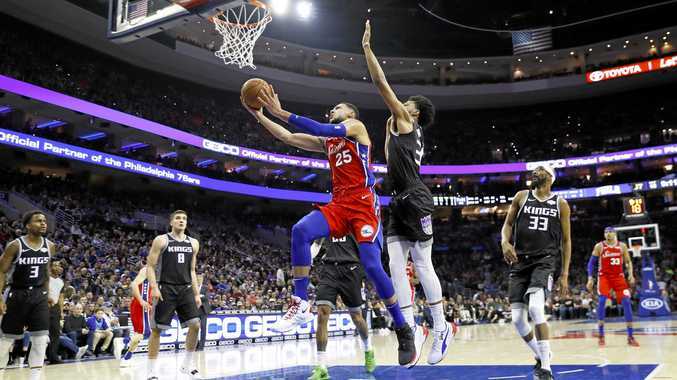 Tobias Harris and JJ Redick each added 19 points, and Australian star Ben Simmons contributed 18 for the 76ers, who won their third in a row to draw level with Indiana in third place in the Eastern Conference. With Philadelphia clinging to a four-point lead with three minutes remaining, Embiid blocked Willie Cauley-Stein's lay-up attempt. Two possessions later, Embiid rejected Barnes's close-range try before hitting a short jumper of his own to make it 121-114 with 1:45 remaining. Simmons also registered two rebounds and five assists. Elsewhere, Langston Galloway scored 23 points off the bench as the Detroit Pistons downed the depleted Los Angeles Lakers 111-97. The Lakers rested superstar LeBron James after he scored 29 points in a loss to Toronto on Thursday. Tyson Chandler (neck), Josh Hart (knee) and Lance Stephenson (toe) also sat out as LA lost their seventh game from eight. James Harden registered 41 points, 11 assists and nine rebounds to help the Rockets to a tough 108-102 victory over the lowly Phoenix Suns. The Rockets had trouble putting away the Suns, who have won just 16 games this season, and trailed for much of the night as they struggled from long range, making just 11 of 40 three-pointer attempts. Milwaukee overcame a 23-point first-quarter deficit to overcome the Miami Heat 113-98 thanks to a 49th career double-double for Giannis Antetokounmpo. He tallied 33 points, 16 rebounds and nine assists for the Bucks, who top the NBA with 52 wins, including 25 on the road. The Bucks outscored the Heat 71-36 in the second half to seize control of the game, and Milwaukee won its league-best 16th game when having trailed by more than 10 points in a game this season. Damian Lillard's scored 24-point haul left him as Portland's second-highest scorer in franchise history, another reason to celebrate a 122-110 win over the New Orleans Pelicans. Lillard passed LaMarcus Aldridge (12,562) and is now on 12,584, leaving only Clyde Drexler ahead of him with 18,040. New Orleans' Julius Randle had a career-high 45 points and 11 rebounds, falling four assists short of a triple-double. In San Antonio, LaMarcus Aldridge registered 18 points and 11 rebounds as the San Antonio Spurs beat the New York Knicks 109-83 on Friday night to extend their season-best winning streak to seven games. The Charlotte Hornets beat the Washington Wizards 116-110, and the Los Angeles Clippers repulsed the Chicago Bulls 128-121.